Fear of making mistakes holding you back? This is not something to be judged because we all do it. I’m not scared of taking a risk with creativity but I do have my own fears. But at the very top of the list was the most terrifying thing of all “Solo Karaoke” – yes I was more scared of getting up on stage and singing by myself under a spotlight than strapping myself to a stranger and allowing him to throw me out of a plane. I can hear you laughing now! Yes it seems ridiculous, but the actual fear was not the singing but the chance that I would make a terrible job of it, make an awful mistake and be ridiculed. So I set off on my travels and found myself in Thailand with a group of women travelling solo too. One evening we were booked on a dinner cruise down a scenic river and you guessed it the only entertainment was Karaoke. I literally couldn’t run away from the mic unless I jumped off the boat and swam to the river bank. So after a few drinks, I scanned the song sheet and chose my first ever Karaoke song. “Play that Funky Music” by Wild Cherry. Apparently, it was a big hit in 1976 haha! And so I went up onto the stage, had to get past my nerves and sing my song. After the initial nerves I actually began to love it – and in that one moment, I realised how paralysing my fear of mistakes had held me back in many areas of my life, and how easy it had been to break free of this one. If you have a fear of making a mistake it will be holding you back in your life. Have you ever noticed that the most successful people in the world are those who seem to have no fear of taking a chance? They take risks that us mere mortals wouldn’t dare – specifically I am thinking about Richard Branson who has lost his fortune several times over the years to bounce back even more successful. But why is that? Because he has developed a creative mindset, he has learned the art of risk taking and understands the benefits of making mistakes. So how do you learn the art of taking risks and reduced fear of making mistakes? The answer is creativity. Creativity teaches you to try new things, to take risks, to be bold and to push yourself outside of your comfort zone. Making mistakes is a big part of the creative process; you learn from them, adapt and try again. This skill is essential in business too – the most successful businesses are those who are prepared to take a calculated risk, to try something new, to innovate – and those who play safe are left behind. Learning the benefit of making mistakes is a key part of my Creative Thinking Coaching – from learning the art of doodling to throwing paint at a canvas along with targetted coaching can teach you not just how to take chances on your canvas but in your life. Whether it is deciding to join that salsa class you’ve always wanted to try, going for a new role at work, asking someone out on a date you really like or yes singing Karaoke embracing the creative process will help give you the confidence to take a chance in all areas of your lives. So why not learn how to wake up your creative mindset, learn how to take chances while having fun? Here are 5 ideas that can start you off on developing your creative mindset. Take a single colour pen and a sheet of paper and spend 10 minutes doodling – for no reason, without judgement. Allow yourself time to daydream, watch the clouds and see what shapes you see, what can you imagine. Write a story using only 6 words. Print off a photo or image and spend 10 minutes with a pencil adjusting it, adding to it or modifying it. Start making a list of things that interest you or start your own Pinterest page. Or ….. you could strap yourself to a stranger and allow them to throw you out of a plane. I know which ones are less scary. PS If you want to learn how let go of the fear of making mistakes in any area of your life, do book a FREE Discovery Session with me and we can work out how I can help you live a bigger life too. Great post Angela. Your tip about doodling for 10minutes you also mentioned at your launch is something I am looking forward to implementing today before a business meeting. Thanks! Oooh let me know how you go with that. I find it not only quietens my monkey mind chatter but relaxes me too. 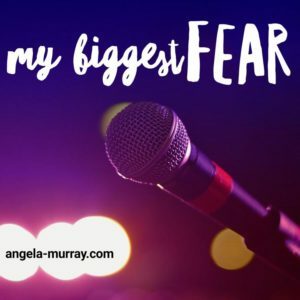 Thank you for commenting on this – fear is such a big thing at times, but the fact you are showing up and stepping up despite that is a massive credit to you. You are amazing- you do realise? ? Looking forward to seeing you in group tonight.